Not to be confused with Acetyl chloride. Acetylcholine (ACh) is an organic chemical that functions in the brain and body of many types of animals, including humans, as a neurotransmitter—a chemical message released by nerve cells to send signals to other cells [neurons, muscle cells, and gland cells]. Its name is derived from its chemical structure: it is an ester of acetic acid and choline. Parts in the body that use or are affected by acetylcholine are referred to as cholinergic. Substances that interfere with acetylcholine activity are called anticholinergics. Acetylcholine is the neurotransmitter used at the neuromuscular junction—in other words, it is the chemical that motor neurons of the nervous system release in order to activate muscles. This property means that drugs that affect cholinergic systems can have very dangerous effects ranging from paralysis to convulsions. Acetylcholine is also a neurotransmitter in the autonomic nervous system, both as an internal transmitter for the sympathetic nervous system and as the final product released by the parasympathetic nervous system. Acetylcholine (ACh), has also been traced in cells of non-neural origins and microbes. Recently, enzymes related to its synthesis, degradation and cellular uptake have been traced back to early origins of unicellular eukaryotes. The protist pathogen Acanthamoeba spp. has shown the presence of ACh, which provides growth and proliferative signals via a membrane located M1-muscarinic receptor homolog. In the brain, acetylcholine functions as a neurotransmitter and as a neuromodulator. The brain contains a number of cholinergic areas, each with distinct functions; such as playing an important role in arousal, attention, memory and motivation. Acetylcholine is a choline molecule that has been acetylated at the oxygen atom. Because of the presence of a highly polar, charged ammonium group, acetylcholine does not penetrate lipid membranes. Because of this, when the drug is introduced externally, it remains in the extracellular space and does not pass through the blood–brain barrier. A synonym of this drug is miochol. Acetylcholine is synthesized in certain neurons by the enzyme choline acetyltransferase from the compounds choline and acetyl-CoA. Cholinergic neurons are capable of producing ACh. An example of a central cholinergic area is the nucleus basalis of Meynert in the basal forebrain. The enzyme acetylcholinesterase converts acetylcholine into the inactive metabolites choline and acetate. This enzyme is abundant in the synaptic cleft, and its role in rapidly clearing free acetylcholine from the synapse is essential for proper muscle function. Certain neurotoxins work by inhibiting acetylcholinesterase, thus leading to excess acetylcholine at the neuromuscular junction, causing paralysis of the muscles needed for breathing and stopping the beating of the heart. Acetylcholine processing in a synapse. 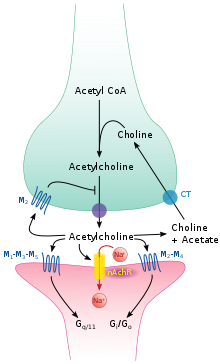 After release acetylcholine is broken down by the enzyme acetylcholinesterase. Like many other biologically active substances, acetylcholine exerts its effects by binding to and activating receptors located on the surface of cells. There are two main classes of acetylcholine receptor, nicotinic and muscarinic. They are named for chemicals that can selectively activate each type of receptor without activating the other: muscarine is a compound found in the mushroom Amanita muscaria; nicotine is found in tobacco. Nicotinic acetylcholine receptors are ligand-gated ion channels permeable to sodium, potassium, and calcium ions. In other words, they are ion channels embedded in cell membranes, capable of switching from a closed to an open state when acetylcholine binds to them; in the open state they allow ions to pass through. Nicotinic receptors come in two main types, known as muscle-type and neuronal-type. The muscle-type can be selectively blocked by curare, the neuronal-type by hexamethonium. The main location of muscle-type receptors is on muscle cells, as described in more detail below. Neuronal-type receptors are located in autonomic ganglia (both sympathetic and parasympathetic), and in the central nervous system. Muscarinic acetylcholine receptors have a more complex mechanism, and affect target cells over a longer time frame. In mammals, five subtypes of muscarinic receptors have been identified, labeled M1 through M5. All of them function as G protein-coupled receptors, meaning that they exert their effects via a second messenger system. The M1, M3, and M5 subtypes are Gq-coupled; they increase intracellular levels of IP3 and calcium by activating phospholipase C. Their effect on target cells is usually excitatory. The M2 and M4 subtypes are Gi/Go-coupled; they decrease intracellular levels of cAMP by inhibiting adenylate cyclase. Their effect on target cells is usually inhibitory. Muscarinic acetylcholine receptors are found in both the central nervous system and the peripheral nervous system of the heart, lungs, upper gastrointestinal tract, and sweat glands. Acetylcholine is the substance the nervous system uses to activate skeletal muscles, a kind of striated muscle. These are the muscles used for all types of voluntary movement, in contrast to smooth muscle tissue, which is involved in a range of involuntary activities such as movement of food through the gastrointestinal tract and constriction of blood vessels. Skeletal muscles are directly controlled by motor neurons located in the spinal cord or, in a few cases, the brainstem. These motor neurons send their axons through motor nerves, from which they emerge to connect to muscle fibers at a special type of synapse called the neuromuscular junction. When a motor neuron generates an action potential, it travels rapidly along the nerve until it reaches the neuromuscular junction, where it initiates an electrochemical process that causes acetylcholine to be released into the space between the presynaptic terminal and the muscle fiber. The acetylcholine molecules then bind to nicotinic ion-channel receptors on the muscle cell membrane, causing the ion channels to open. Sodium ions then flow into the muscle cell, initiating a sequence of steps that finally produce muscle contraction. Calcium channel blockers (nifedipine, diltiazem) do not affect P-channels. These drugs affect L-type calcium channels. Components and connections of the parasympathetic nervous system. 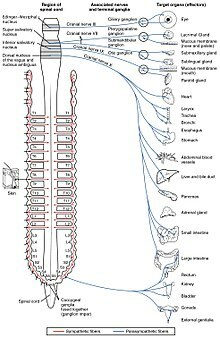 The autonomic nervous system controls a wide range of involuntary and unconscious body functions. Its main branches are the sympathetic nervous system and parasympathetic nervous system. Broadly speaking, the function of the sympathetic nervous system is to mobilize the body for action; the phrase often invoked to describe it is fight-or-flight. The function of the parasympathetic nervous system is to put the body in a state conducive to rest, regeneration, digestion, and reproduction; the phrase often invoked to describe it is "rest and digest" or "feed and breed". Both of these aforementioned systems use acetylcholine, but in different ways. At a schematic level, the sympathetic and parasympathetic nervous systems are both organized in essentially the same way: preganglionic neurons in the central nervous system send projections to neurons located in autonomic ganglia, which send output projections to virtually every tissue of the body. In both branches the internal connections, the projections from the central nervous system to the autonomic ganglia, use acetylcholine as a neurotransmitter to innervate (or excite) cholinergic neurons (neurons expressing nicotinic acetylcholine receptors). In the parasympathetic nervous system the output connections, the projections from ganglion neurons to tissues that don't belong to the nervous system, also release acetylcholine but act on muscarinic receptors. In the sympathetic nervous system the output connections mainly release noradrenaline, although acetylcholine is released at a few points, such as the sudomotor innervation of the sweat glands. Acetylcholine in the serum exerts a direct effect on vascular tone by binding to muscarinic receptors present on vascular endothelium. These cells respond by increasing production of nitric oxide, which signals the surrounding smooth muscle to relax, leading to vasodilation. Micrograph of the nucleus basalis (of Meynert), which produces acetylcholine in the CNS. LFB-HE stain. In the central nervous system, ACh has a variety of effects on plasticity, arousal and reward. ACh has an important role in the enhancement of alertness when we wake up, in sustaining attention  and in learning and memory. Damage to the cholinergic (acetylcholine-producing) system in the brain has been shown to be associated with the memory deficits associated with Alzheimer's disease. ACh has also been shown to promote REM sleep. The pontomesencephalotegmental complex acts mainly on M1 receptors in the brainstem, deep cerebellar nuclei, pontine nuclei, locus coeruleus, raphe nucleus, lateral reticular nucleus and inferior olive. It also projects to the thalamus, tectum, basal ganglia and basal forebrain. Basal nucleus of Meynert acts mainly on M1 receptors in the neocortex. Medial septal nucleus acts mainly on M1 receptors in the hippocampus and parts of the cerebral cortex. 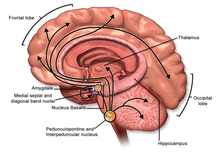 In addition, ACh acts as an important internal transmitter in the striatum, which is part of the basal ganglia. It is released by cholinergic interneurons. In humans, non-human primates and rodents, these interneurons respond to salient environmental stimuli with responses that are temporally aligned with the responses of dopaminergic neurons of the substantia nigra. Acetylcholine has been implicated in learning and memory in several ways. The anticholinergic drug, scopolamine, impairs acquisition of new information in humans and animals. In animals, disruption of the supply of acetylcholine to the neocortex impairs the learning of simple discrimination tasks, comparable to the acquisition of factual information and disruption of the supply of acetylcholine to the hippocampus and adjacent cortical areas produces forgetting comparable to anterograde amnesia in humans. The disease myasthenia gravis, characterized by muscle weakness and fatigue, occurs when the body inappropriately produces antibodies against acetylcholine nicotinic receptors, and thus inhibits proper acetylcholine signal transmission. Over time, the motor end plate is destroyed. Drugs that competitively inhibit acetylcholinesterase (e.g., neostigmine, physostigmine, or primarily pyridostigmine) are effective in treating this disorder. They allow endogenously released acetylcholine more time to interact with its respective receptor before being inactivated by acetylcholinesterase in the synaptic cleft (the space between nerve and muscle). Blocking, hindering or mimicking the action of acetylcholine has many uses in medicine. Drugs acting on the acetylcholine system are either agonists to the receptors, stimulating the system, or antagonists, inhibiting it. Acetylcholine receptor agonists and antagonists can either have an effect directly on the receptors or exert their effects indirectly, e.g., by affecting the enzyme acetylcholinesterase, which degrades the receptor ligand. Agonists increase the level of receptor activation, antagonists reduce it. Acetylcholine itself does not have therapeutic value as a drug for intravenous administration because of its multi-faceted action(non-selective) and rapid inactivation by cholinesterase. However, it is used in the form of eye drops to cause constriction of the pupil during cataract surgery, which facilitates quick post-operational recovery. Nicotine binds to and activates nicotinic acetylcholine receptors, mimicking the effect of acetylcholine at these receptors. When ACh interacts with a nicotinic ACh receptor, it opens a Na+ channel and Na+ ions flow into the membrane. This causes a depolarization, and results in an excitatory post-synaptic potential. Thus, ACh is excitatory on skeletal muscle; the electrical response is fast and short-lived. Curares are arrow poisons, which act at nicotinic receptors and have been used to develop clinically useful therapies. Atropine is a non-selective competitive antagonist with Acetylcholine at muscarinic receptors. Many ACh receptor agonists work indirectly by inhibiting the enzyme acetylcholinesterase. The resulting accumulation of acetylcholine causes continuous stimulation of the muscles, glands, and central nervous system, which can result in fatal convulsions if the dose is high. They are examples of enzyme inhibitors, and increase the action of acetylcholine by delaying its degradation; some have been used as nerve agents (Sarin and VX nerve gas) or pesticides (organophosphates and the carbamates). Many toxins and venoms produced by plants and animals also contain cholinesterase inhibitors. In clinical use, they are administered in low doses to reverse the action of muscle relaxants, to treat myasthenia gravis, and to treat symptoms of Alzheimer's disease (rivastigmine, which increases cholinergic activity in the brain). Organic mercurial compounds, such as methylmercury, have a high affinity for sulfhydryl groups, which causes dysfunction of the enzyme choline acetyltransferase. This inhibition may lead to acetylcholine deficiency, and can have consequences on motor function. Botulinum toxin (Botox) acts by suppressing the release of acetylcholine, whereas the venom from a black widow spider (alpha-latrotoxin) has the reverse effect. ACh inhibition causes paralysis. When bitten by a black widow spider, one experiences the wastage of ACh supplies and the muscles begin to contract. If and when the supply is depleted, paralysis occurs. Acetylcholine is used by organisms in all domains of life for a variety of purposes. It is believed that choline, a precursor to acetylcholine, was used by single celled organisms billions of years ago for synthesizing cell membrane phospholipids. Following the evolution of choline transporters, the abundance of intracellular choline paved the way for choline to become incorporated into other synthetic pathways, including acetylcholine production. Acetylcholine is used by bacteria, fungi, and a variety of other animals. Many of the uses of acetylcholine rely on its action on ion channels via GPCRs like membrane proteins. The two major types of acetylcholine receptors, muscarinic and nicotinic receptors, have convergently evolved to be responsive to acetylcholine. This means that rather than having evolved from a common homolog, these receptors evolved from separate receptor families. It is estimated that the nicotinic receptor family dates back longer than 2.5 billion years. Likewise, muscarinic receptors are thought to have diverged from other GPCRs at least 0.5 billion years ago. Both of these receptor groups have evolved numerous subtypes with unique ligand affinities and signaling mechanisms. The diversity of the receptor types enables acetylcholine to creating varying responses depending on which receptor types are activated, and allow for acetylcholine to dynamically regulate physiological processes. Acetylcholine (ACh) was first identified in 1915 by Henry Hallett Dale for its actions on heart tissue. It was confirmed as a neurotransmitter by Otto Loewi, who initially gave it the name Vagusstoff because it was released from the vagus nerve. Both received the 1936 Nobel Prize in Physiology or Medicine for their work. Acetylcholine was also the first neurotransmitter to be identified. ^ a b Tiwari, Prashant; Dwivedi, Shubhangi; Singh, Mukesh Pratap; Mishra, Rahul; Chandy, Anish (2017-05-15). 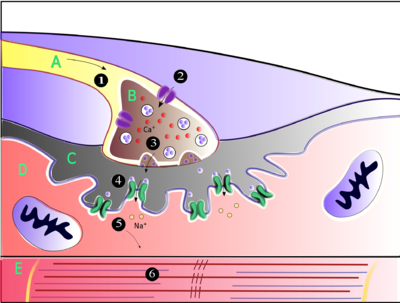 "Basic and modern concepts on cholinergic receptor: A review". Asian Pacific Journal of Tropical Disease. 3 (5): 413–420. doi:10.1016/S2222-1808(13)60094-8. ISSN 2222-1808. PMC 4027320. ^ Baig AM, Rana Z, Tariq S, Lalani S, Ahmad HR (March 2018). "Traced on the Timeline: Discovery of Acetylcholine and the Components of the Human Cholinergic System in a Primitive Unicellular Eukaryote Acanthamoeba spp". ACS Chem Neurosci. 9 (3): 494–504. doi:10.1021/acschemneuro.7b00254. PMID 29058403. ^ Baig AM, Ahmad HR (June 2017). "Evidence of a M1-muscarinic GPCR homolog in unicellular eukaryotes: featuring Acanthamoeba spp bioinformatics 3D-modelling and experimentations". J. Recept. Signal Transduct. Res. 37 (3): 267–275. doi:10.1080/10799893.2016.1217884. PMID 27601178. ^ Smythies J (2009). "Philosophy, perception, and neuroscience". Perception. 38 (5): 638–51. doi:10.1068/p6025. PMID 19662940. ^ Smythies J, d'Oreye de Lantremange M (2016). "The Nature and Function of Digital Information Compression Mechanisms in the Brain and in Digital Television Technology". Front Syst Neurosci. 10: 40. doi:10.3389/fnsys.2016.00040. PMC 4858531. PMID 27199688. ^ Miller RD, Eriksson LI, Fleisher LA, Wiener-Kronish JP, Young WL, eds. (2009-01-01). Miller's Anesthesia (7th ed.). Elsevier Health Sciences. pp. 343–47. ISBN 0-443-06959-X. ^ Kellogg DL, Zhao JL, Coey U, Green JV (February 2005). "Acetylcholine-induced vasodilation is mediated by nitric oxide and prostaglandins in human skin". J. Appl. Physiol. 98 (2): 629–32. doi:10.1152/japplphysiol.00728.2004. PMID 15649880. ^ Jones BE (November 2005). "From waking to sleeping: neuronal and chemical substrates". Trends Pharmacol. Sci. 26 (11): 578–86. doi:10.1016/j.tips.2005.09.009. PMID 16183137. ^ Himmelheber AM, Sarter M, Bruno JP (June 2000). "Increases in cortical acetylcholine release during sustained attention performance in rats". Brain Res Cogn Brain Res. 9 (3): 313–25. doi:10.1016/S0926-6410(00)00012-4. PMID 10808142. ^ a b Ridley RM, Bowes PM, Baker HF, Crow TJ (1984). "An involvement of acetylcholine in object discrimination learning and memory in the marmoset". Neuropsychologia. 22 (3): 253–63. doi:10.1016/0028-3932(84)90073-3. PMID 6431311. ^ Francis PT, Palmer AM, Snape M, Wilcock GK (February 1999). "The cholinergic hypothesis of Alzheimer's disease: a review of progress". J. Neurol. Neurosurg. Psychiatry. 66 (2): 137–47. doi:10.1136/jnnp.66.2.137. PMC 1736202. PMID 10071091. ^ Platt B, Riedel G (August 2011). "The cholinergic system, EEG and sleep". Behav. Brain Res. 221 (2): 499–504. doi:10.1016/j.bbr.2011.01.017. PMID 21238497. ^ a b Woolf NJ, Butcher LL (May 1986). "Cholinergic systems in the rat brain: III. Projections from the pontomesencephalic tegmentum to the thalamus, tectum, basal ganglia, and basal forebrain". Brain Res. Bull. 16 (5): 603–37. doi:10.1016/0361-9230(86)90134-6. PMID 3742247. ^ a b Woolf NJ, Butcher LL (December 1989). "Cholinergic systems in the rat brain: IV. Descending projections of the pontomesencephalic tegmentum". Brain Res. Bull. 23 (6): 519–40. doi:10.1016/0361-9230(89)90197-4. PMID 2611694. ^ Goldberg JA, Reynolds JN (December 2011). "Spontaneous firing and evoked pauses in the tonically active cholinergic interneurons of the striatum". Neuroscience. 198: 27–43. doi:10.1016/j.neuroscience.2011.08.067. PMID 21925242. ^ Morris G, Arkadir D, Nevet A, Vaadia E, Bergman H (July 2004). "Coincident but distinct messages of midbrain dopamine and striatal tonically active neurons". Neuron. 43 (1): 133–43. doi:10.1016/j.neuron.2004.06.012. PMID 15233923. ^ Crow TJ, Grove-White IG (October 1973). "An analysis of the learning deficit following hyoscine administration to man". Br. J. Pharmacol. 49 (2): 322–7. doi:10.1111/j.1476-5381.1973.tb08379.x. PMC 1776392. PMID 4793334. ^ Ridley RM, Murray TK, Johnson JA, Baker HF (June 1986). "Learning impairment following lesion of the basal nucleus of Meynert in the marmoset: modification by cholinergic drugs". Brain Res. 376 (1): 108–16. doi:10.1016/0006-8993(86)90904-2. PMID 3087582. ^ Easton A, Ridley RM, Baker HF, Gaffan D (July 2002). "Unilateral lesions of the cholinergic basal forebrain and fornix in one hemisphere and inferior temporal cortex in the opposite hemisphere produce severe learning impairments in rhesus monkeys". Cereb. Cortex. 12 (7): 729–36. doi:10.1093/cercor/12.7.729. PMID 12050084. ^ a b Dean B (November 2009). "Evolution of the human CNS cholineric system: has this resulted in the emergence of psychiatric disease?". Aust N Z J Psychiatry. 43 (11): 1016–28. doi:10.3109/00048670903270431. PMID 20001397. Brenner, G.M. ; Stevens, C.W. (2006). Pharmacology (2nd ed.). Philadelphia PA: W.B. Saunders. ISBN 1-4160-2984-2. Canadian Pharmacists Association (2000). Compendium of Pharmaceuticals and Specialties (25th ed.). Toronto ON: Webcom. ISBN 0-919115-76-4. Carlson, NR (2001). Physiology of Behavior (7th ed.). Needham Heights MA: Allyn and Bacon. ISBN 0-205-30840-6. Siegal, A.; Sapru, H.N. (2006). "Ch. 15". Essential Neuroscience (Revised 1st ed.). Philadelphia: Lippincott, Williams & Wilkins. pp. 255–267.